I got a "Dear Wavers" email from Google last week. It's a "Dear John" letter following up on their announcement from last year that they Google Wave would no longer be developed as a separate product. Though some people were using the Wave product and were sad to see the experiment end, it never caught on in any big way, especially in education. Google originally said they would maintain the site at least through to the end of 2010, so they did give it an extra year. But it will be sunseting and "as of January 31, 2012, all waves will be read-only, and the Wave service will be turned off on April 30,2012." Google also suggests some open source projects to try. Apache Wave is one of those. Another project called Walkaround includes an experimental feature that lets you import all your Waves from Google (but grab them before April 30). Selected resources for educators from Jane Hart's Google Wave Reading List. Bryan commented on my recent Android post and alluded to Google Wave. Wave is a under-development app that pushes what is possible in the browser. It was given a developer preview at Google I/O. There is a video (80 minutes) of I/O you can view (including a few crashes). 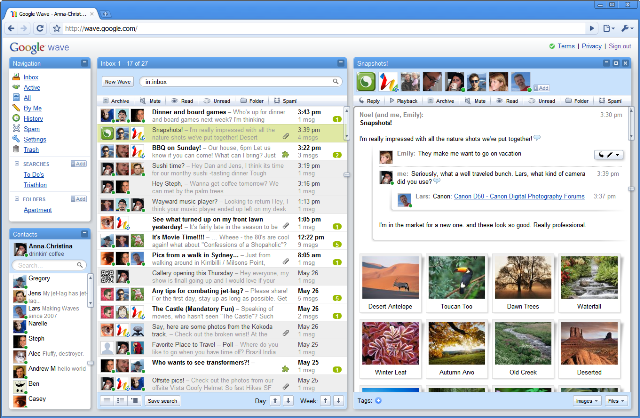 Google Wave is for communication and collaboration on the web. It will launch later this year. It is open source and they will rely on the community to help build the tool. It is conjecture now, but I can imagine this tool easily being used for synchronous communication in courses. I can also imagine a time, not so far in the future, when we can build our own "learning management system" using free and open tools. Take note Blackboard. A wave is equal parts conversation and document. People can communicate and work together with richly formatted text, photos, videos, maps, and more.A wave is shared. Any participant can reply anywhere in the message, edit the content and add participants at any point in the process. Then playback lets anyone rewind the wave to see who said what and when.A wave is live. With live transmission as you type, participants on a wave can have faster conversations, see edits and interact with extensions in real-time. They demonstrated using Orkut with Wave, so I guess Orkut is still very active though it still has not gained a big user base in the U.S. (I haven't used it in any serious way since 2006.) Of course, Wave also works with an Android phone or iPhone. Some parts of this app aren't even supported in HTML 5, so it is pushing the walls of the box. Perhaps, Wave is an answer to the question "What would email look like if it was just being developed today?" Real-time collaboration. Natural language tools. Wave's concurrency control technology lets all people on a wave edit rich media at the same time. If you are on the tech side of things, watch their tech video. Developer types can learn how to put waves in your site and build wave extensions with the Google Wave APIs. Google Wave uses an open protocol, so anyone can build their own wave system. This is all (standard procedure for Google) very "beta" for now, but you can watch the video, sign up for updates and, if you are the tech type, learn more about how to develop with Google Wave. Now Everyone Can Use Wave. We Just Have To Figure What To Do With It. Last week, Google made their Wave product available to everyone as part of Google Labs. Before this, you had needed an invite to use Wave. I started previewing Wave along with a few others back in November 2009 and I was thoroughly unimpressed. Like many people who tried Wave, I really didn't even a clear sense of what Wave was designed to do. I'm not sure Google knew either - or, at least, they were unable to communicate it to the masses. I checked out the first user guide to Google Wave, written by Gina Trapani with Adam Pash.They start by saying that "Google Wave is a new web-based collaboration tool that's notoriously difficult to understand. I'll be honest and admit I gave up on it. It is a solution to a problem I don't have. People who have given it good reviews find it a great place for teams working together on projects that involve lots of discussion. Sounds like it would be great for teaching online, right? I wasn't the only one who gave up. Google even did a video that suggests we give it another shot. Apparently, Wave is faster, more stable, somewhat easier to use and now has email notifications of changes, more permission management options and an extensions gallery. Google posted some examples of Wave users. On the business side, you have co-workers writing software code (Lyn and Line) and coordinating ad campaigns (Clear Channel Radio) and an international As One project (Deloitte). In education, they point to students and professors using waves to collaborate on Latin poetry translations, write academic research papers and build new functionality with Wave's APIs. Just to keep all of us in higher education honest, there is also a teacher having her 5th-graders do their class research in Wave. To try Wave, go to wave.google.com and sign in. Google Apps administrators (businesses, schools, organizations) can enable Google Wave for their users. Lars Rasmussen, a software engineering manager at Google, first connected with the company when, in 2004, Google took an interest in a mapping startup called Where 2 Tech that he founded with his brother Jens. They joined Google and helped to create what would become Google Maps. What next? They realized 2 big killer apps - email and instant messaging - basically imitate analog formats. Email is based on "snail mail" and IM follows the model of phone calls. Taking into account what has come since - blogs, wikis, collaborative documents and much improved computers and networks - got them thinking about their next project. They codenamed it "Walkabout" and we now know it as Google Wave. We have seen a demo of what it is intended to be. It attempts to erase the lines between email and chat and conversation versus documents to a single web continuum. It doesn't start by imitating non-electronic forms, but by thinking through the digital potentials. A "wave" itself is a combination conversation and document. I suppose it rolls on like a watery wave but of flowing photos, videos, maps, and more. You catch a wave, then you add people to it. That's not something ocean surfers enjoy, but its a collaboration that digital surfers would enjoy. Everyone riding your wave can use richly formatted text, photos, gadgets, feeds from other web sources, insert a reply or edit the wave directly. Because it is synchronous rich-text editing, you will see the results on your screen nearly instantly when your fellow waveriders are collaborating. Now, this is cool. You can also use "playback" to rewind the wave and see how it evolved. The code for Wave will be open source to encourage the developer community to get involved. There are 3 layers to Google Wave: product, platform, and the protocol. The product is the web application people will use to access and edit waves. You can also think of Wave as a platform with open APIs that allows developers to embed waves in other web services, and to build new extensions that work inside waves. "The Google Wave is the underlying format for storing and the means of sharing waves, and includes the "live" concurrency control, which allows edits to be reflected instantly across users and services. The protocol is designed for open federation, such that anyone's Wave services can interoperate with each other and with the Google Wave service. To encourage adoption of the protocol, we intend to open source the code behind Google Wave. So, this leaves one big question we need your help answering: What else can we do with this?" What else do you think we can or should do with the Wave in educational settings?